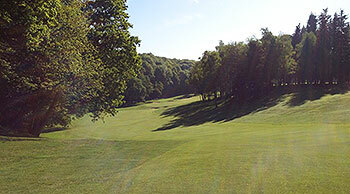 Royal Waterloo Golf Club was founded in 1923 when golf was played at Rhode-Saint-Genèse. In 1960, the club moved to Lasne, its present location at the epicentre of the historic battlefield of Waterloo, and has never looked back. La Marache is the premier layout at Royal Waterloo and Fred W. Hawtree was the architect that originally designed the course in 1960. He also laid out two separate 9-hole courses, which were formerly known as C & D (La Marache originally comprised the A & B nines). The club continued to develop and improve over the years and today can boast forty-five golf holes, the 18-hole La Marache, the 18-hole Le Lion and the 9-hole Le Bois-Héros. If you only have enough time while visiting Royal Waterloo to play eighteen holes, the course to choose is La Marache, which underwent extensive greens redevelopment in 2007 by none other than… yes, you guessed it, Martin Hawtree. La Marache doesn't get sufficient recognition. It is one of Hawtree's finest designs and is set in a delightfully undulating but rather tricky woodland environment. And, located a mere 25 minutes drive by car from the centre of Brussels, Royal Waterloo is not only very accessible, but also an excellent golfing test. Host to the Belgian Open on several occasions between 1979 and 1991, La Marache has seen plenty of professional action with Per-Ulrik Johansson, Gordon J. Brand and Eamonn Darcy among the winners at Royal Waterloo Golf Club. La Marache is, quite simply, superb. In fabulous condition and the most wonderful design set amongst mature woodlands. Although it opens quietly with two fairly routine par four holes, the third is a triumphant example of what is yet to come. A wonderful, sweeping par five dog-leg down into a valley turning right hand up to a raised green. The tree-lined fairways are lush and scrupulously maintained with not an unrepaired divot mark to be seen and the greens are small, firm and fast with some treacherous run-offs. On a number of occasions I hit what I thought were some fine shots in only to find my ball nestling in the short but remarkably thick stuff that surrounds each hole. There really is not a weak hole on the course and each has its own test and character. The sun was shining, the birds were singing and it was a privilege to play such a wonderful course. Belgium boasts a number of world class courses, sadly underplayed by British visitors who traditionally head for France, Spain and now, as often as not Turkey. But for me this comes comfortably in the best 10 courses that I have played in any of those countries. It is no place for the novice but a tremendous challenge for any serious golfer looking for a sensational new venue. I have only one small quibble and that is that the bar staff are not the most welcoming to visitors but that may well be because they are only used to seeing locals who should be justifiably proud of being able to play such a terrific course as La Marache.